Ceramic glazes come glossy and matte, colored and clear, runny or not. It all depends on which of the earth’s elements they include, the temperature in the kiln during firing, and the amount of oxygen surrounding them as they respond to heat. 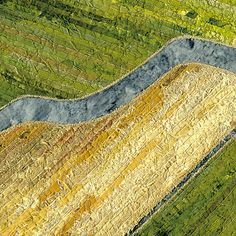 Silica, the most abundant mineral in the earth’s crust, is part of the clay that potters work with and part of the glaze that finishes the clay. It accounts for the vitrification of both clay and glaze in the kiln; that means that both clay and glaze become like glass. 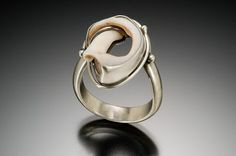 In a crystalline glaze, the amount of silica is exceptional — so is the amount of zinc oxide. In a kiln fired hotter than 2000⁰F, silica and zinc oxide dissolve in molten glaze. Held in the kiln at a temperature where the glaze barely starts to solidify, they begin to interact, forming crystals. How long the kiln stays at that temperature determines in part how large the crystals can become. Diana mixes her own crystalline glazes. Clear plastic boxes with labels like “copper oxide” and “cobalt carbonate” fill a tall cabinet in her garage. Her proprietary formulas, including firing times and temperatures, were born of persistence in the face of numerous failures. No matter how Diana tweaks a formula, however, she never knows exactly what a piece will look like until she pulls it from the kiln. She can smooth all the rings that naturally occur on wheel-thrown pottery but might disrupt crystals; she can create the long or tall pieces of pottery that give crystals space to grow; but she can’t control where the crystals will form. 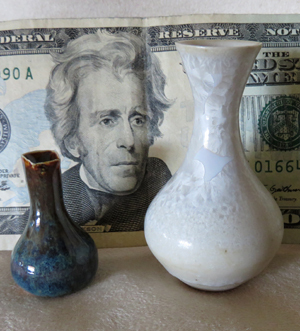 The tallest of Diana Begner’s miniature vases is shorter than American paper currency. The vase on the right was fired with her proprietary crystalline glaze. 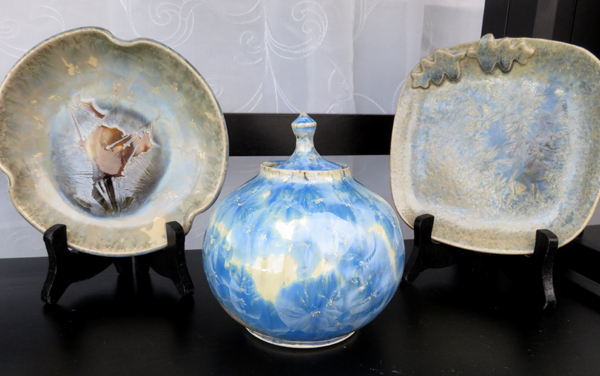 Crystalline glazes weren’t all that caught my eye at the Pine Pottery booth. A large wooden display box showed off miniature vases, including the two pictured here. (A traditional glaze covers the smaller.) Note the size compared to our paper currency. Surely Diana couldn’t have thrown these on a wheel, I thought. I knew that a potter’s hands coax the clay into shape from the inside as well as the outside. When I visited Diana at her studio in Evergreen, she smiled at my bafflement. 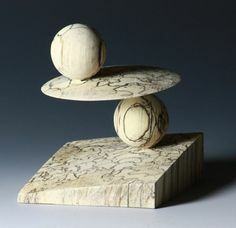 She took a small piece of clay and set it in the middle of a small disk on her potter’s wheel. She sat down straddling the wheel and started it spinning. 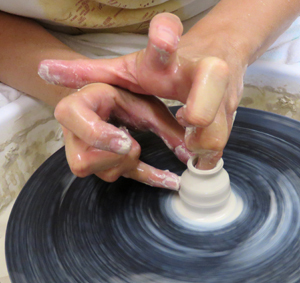 Diana Begner demonstrates how to throw a miniature vase on a potter’s wheel. At first one finger did the job in the middle of the clay that several would do on a larger piece. As Diana pulled the clay up, the neck of the new vase became narrower. Eventually she removed her finger and replaced it with the handle of a fine artist’s brush. Two fingers continued to narrow the throat of the vase on the outside, while the brush handle shaped it on the inside. 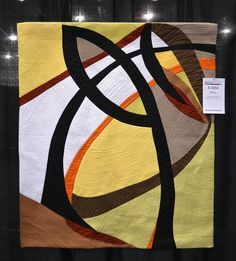 When she had finished shaping it with special potter’s tools, she stopped the wheel and reached for a piece of thread. 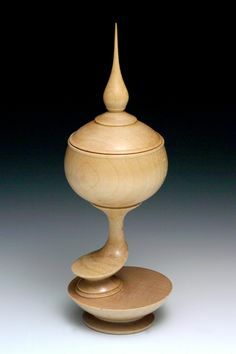 With the thread held taut between her hands, she pulled it between the base of the vase and the wheel. That was all it took to separate clay from the disk it sat on. Diana didn’t move the little vase, though. 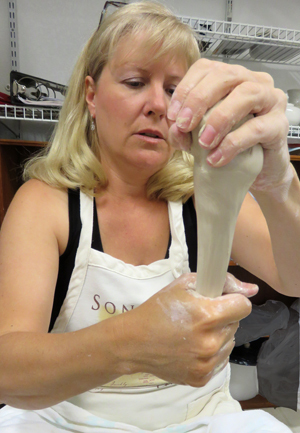 The clay is so malleable, all her creations dry on the wheel to prevent shaping mishaps. In her studio in Evergreen, Colorado, Diana Begner pulls a handle for a porcelain mug. Diana moved one hand down the clay repeatedly while the other held it in air. Eventually a long section even in width and depth hung from the lump of clay in her hand. Diana broke it off and stuck it to the edge of a table where it would hang until it was dry enough to form into the curve of a handle. Without a pause, she started pulling on the chunk of clay again and went through the process again. “I throw several mugs at a time,” she explained. “Then I pull the handles.” In minutes, four nearly identical handles hung from the table’s edge, and the only clean-up required was washing her hands. Diana had proved her point. 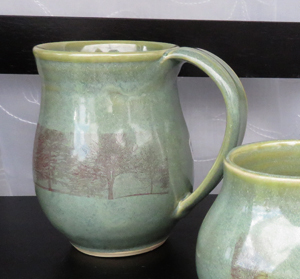 Monochromatic trees decorate this mug by Diana Begner. 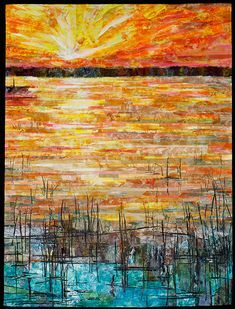 The trees were created by printing a digital image onto a material that completely fuses with the glaze during firing. Diana keeps her eye on what customers seem to want. Although crystalline glazes are her specialty, she fires porcelain or porcelain-like clay with more traditional glazes as well. 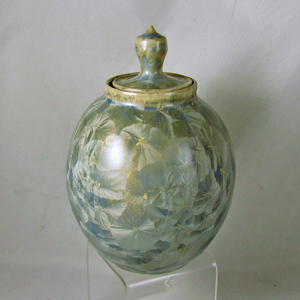 Urns are common in the Pine Pottery collection. Diana’s frustration in finding an acceptable urn for a beloved pet several years ago drove her to provide a variety for customers. She takes special orders and helps customers decide the size they need. 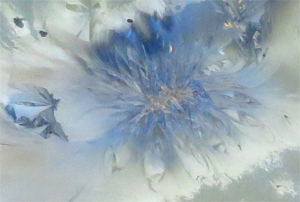 Diana has arranged to have silk fabric printed with enlarged digital images of crystals on her pottery. In 2016 she will introduce sleeveless silk tunics she makes herself from her own patterns. 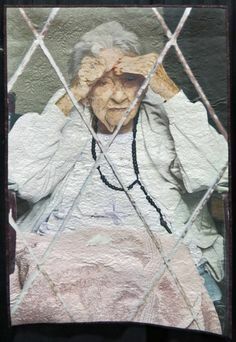 A stunning prototype in soft grays and white hung in her studio while I was there. The Pine Pottery studio will be open to the public during the Open Door Studios tour put on by Evergreen artists, September 19-20. You can also see a selection of what Diana has available right now in her Etsy shop as well as past work on the Pine Pottery website. Sally, I really like these items…..especially the first few.